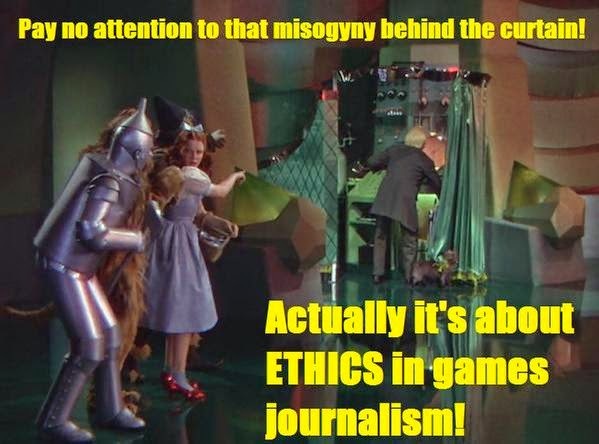 The last few months one of the rallying cries online has been "It's about ethics in games journalism." This has been the justification for extreme harassment, the flimsier the justification, the more intense the harassment. The practices of game journalism are informal and adaptable, and due to the precariousness of the work conditions in the field they may also appear as rather unprofessional. It is customary for the game media (especially the free zines and websites) to employ fans and enthusiasts who are willing to submit game (p)review texts without any other compensation than perhaps the inspection copy of the title they were reviewing. As we have suggested, game journalists often need to balance their act and keep on an even keel with the pressures coming from both the game industry and their readers. The proposed preliminary outline of the occupational ideology of the modern day game journalist is therefore based on a new conception of journalism: journalists do not aim to work as watchdogs of the establishment, but rather as mediators of the value statements that deliver game capital. With the development of a new medium, the collapse of the hegemony of the traditional media, and the increase of enthusiast journalism, game journalism ends up in an awkward counterpoint, where it is hard to decide what is journalism and what is not. Bain, one of the content producers who pointed out the "Shadow of Mordor" issue linked to above, produces videos as "Cynical Brit" and tweets under the name "Totalbisquit", and he goes out of his way to point out that he is not a journalist. This to point out that he can not be expected to follow the ethical guidelines of a journalist. So, what do we expect from journalists? What is the ethics in reivewing that game journalists do not live up to? One of the demands from game journalists is more transparency. David S. Allen discusses the problem with transparency, and points out how this is not necessarily the best way to go for traditional journalism. Siegel suggests that his lack of transparency was wrong because ethical standards are different in a printed publication than they are in the online community. Examples like Siegel’s reinforce the idea that transparency is far from a universal goal in newer media, but rather an instrumental value enlisted to meet certain ends. Siegel was punished for failing to be transparent even though what he did is a common and accepted occurrence in online communication. The magazine used transparency as a way to protect its jurisdiction and its legitimacy. But it also helps us understand the complicated nature of transparency in areas such as identity formation and truth. Transparency might be important to the discovery of truth, but if that transparency limits the ability of a person to freely express himself or herself, it might potentially limit that search. However, it's not just a problem to the journalists, who have to deal with different expectations from their audience and blurred lines between regular online practice and journalistic practice, apparently the public relations departments are not all that concerned with ethics either. This, of course, creates another problem, as the companies reach for control of the communication based on their content. The most recent example of this is the discussion around Nintendo's relationship to youtubers. Their "creator's program" is a system that takes advantage of insecurity around copyright regulations to claim a cut of the income of all who actively play and review or playthrough or perform their games on Youtube. This is a topic where we so far have very few pre-existing examples to go to in order to understand whether or not this is fair or ethical behaviour. On the one hand, the many streamers on Youtube or Twitch who perform the different games can be said to be performers like musicians and actors. If we view a game as the script for a play or a sheet of music, then there are certain rules that says yes, it is reasonable to ask them for payment. However, if the streamers are critics and commentators, it's a very different matter. Either way, they are not necessarily free of "ethics." One of many attempts at writing a code of ethics for online content creators is this from 2011, by Morten Rand-Hendriksen. This takes into consideration transparency, protection of sources, economical considerations and freedom of speech. This is a decent, if not yet fully web 2.0 and beyond compliant code of ethics, fairly well synchronised with the code of the Society of Professional Journalists. So, to the question that prompted this: where can those who are interested in ethics in game journalism go, if they don't stay within the by now painfully splintered hashtag which shall not be named? I don't have a definite answer. But as we have seen a few examples of here, ethics in journalism online is not a new discussion from 2014. Games journalism needs to mature, and it needs to be discussed, but it is important to do so in context with several other discussions. As Bain points out, "journalist" may not be the correct title for game streamers. If so they may be performers, in which case Nintendo's claim to a part of the income from their play may not be as unreasonable as it first seems. Should there be a media-specific set of rules for online journalism? Is reviewing a video game different from commenting on a sports event? An evening at the opera? And what about community- or citizen journalism? In an article uploaded to academia.edu with no further information about where it is published, Jessica Roberts discusses the problems of holding these media to professional standards - and also the problem of citizen journalism competing directly with professional journalists, and how this impacts the quality of the content. 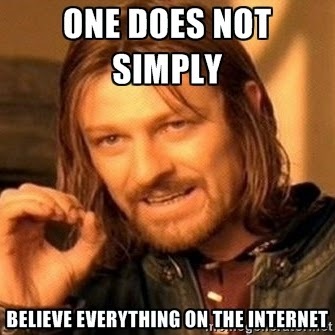 What the internet truly does, is to question the abilities of the readers. With the extreme variety of available content, perhaps what we need to look at isn't an ethics of the writers, but an ethics of the reader? A list of questions to ask of every bit of information found, and of ourselves after reading? The real responsibility online rests, today, with the readers and their ability to read critically, nuanced but still with good will and sufficient understanding. Over the last months imageboard culture has been a lot more visible over the Internet than previously - or, at least to me. In order to understand it, I can recommend two reads, the short version being A man in black Jay Allen's "How imageboard culture shaped #gamergate", the somewhat longer version is Gabriella Coleman's Hacker, hoaxer, whistleblower, spy, her wonderful work on Anonymous. What both authors note is how the 'chan culture values anonymity, and how they go about enforcing it. The technology is designed for a strange kind of surveilled anonymity, where everybody posts behind the same username (mostly "anonymous"), but the moderators know the IP addresses - and several participants build traps in order to catch the addresses of others. On the social surveillance side of enforcing anonymity is the attitude towards those who break the consensus that being part of the faceless crowd is good, these are spoken about in a derogatory manner as "namefags" or "tripfags". Their sin is to want to be different, to retain their own identity in a sea where the safety of all depends on unity. By rejecting identification and an individual voice, imageboard users can experiment safely within their boundaries, protected by the community the way a herring is safe in the camouflage of the school. This reflects something Noell-Neuman notes in her discussions of public opinion in her work on the spiral of silence. Public opinion is, according to her, formed through an almost subconscious awareness of the position of all others around you. Through being social humans, reading the subtle signs of the society surrounding us, opinion is formed not in massive leaps, but in small, almost unremarkable increments. This is how fish in a school will know which direction the school is heading, through a constant, immersed reading of all the fish around them. This metaphor fits well with the idea that anonymity will let the strongest arguments float to the top, one of the main arguments in favour of chanonymity. However, the fish in a school do not necessarily swim in the most rational direction, they just swim in the direction of the majority. Another description of this type of socially enforced unity has found its poetic expression in Aksel Sandemoses book "A fugitive crosses his tracks", where he describes "the law of Jante". The Jante Law has, in many ways, come to describe everything bad about small-town Scandinavia, but like the enforced and carefully surveilled anonymity of chan culture, it also creates a strong sense of unity, loyalty and understanding of equality. At its best, this culture aims at a general and mutual quality of life as more valuable than the quality of life for individuals, it can almost be seen as a rallying cry for utilitarian hedonism. At its worst - which was how Sandemose experienced it - it is destructive, harsh, cruel, and it cuts down all creativity, all independent rational thinking, and creates small-minded, mean individuals. I don't know about you, but I think I'll go read Sandemose again. Written in 1933, it is obviously not limited to a place and a time. It is rather the law of enforced group thinking, of intense social policing and mob rule, and can let us understand something as surprising, but also human, as chan culture.